Nitrates In Drinking Water | Oregon Water Conditioning "
Nitrates are a common contaminant in the Lancaster County area. If you are maintaining your own well for drinking water, you should be testing the water for Bacteria and Nitrates on a regular basis. We also recommend testing for Iron, Manganese, pH, Hardness, and TDS at least every few years. Nitrates in your drinking water can be harmful to small babies, and is also known to cause miscarriages or abortions. 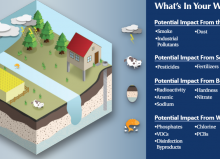 The EPA has set a maximum level of 10 ppm for Nitrates in personal drinking water. On animal consumption the symptoms are similar, but the maximum levels are slightly different.